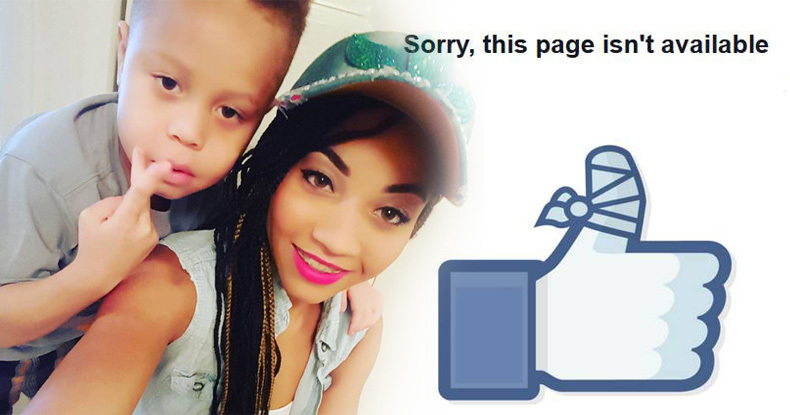 Baltimore, MD – Police acknowledged on Tuesday that Facebook deactivated the Facebook and Instagram accounts of Korryn Gaines, at the request of law enforcement officials. The 23-year-old mother was killed by Baltimore County Police Monday after a standoff with police that lasted several hours. Her 5-year old son was also shot during the encounter and is reportedly in stable condition. As The Free Thought Project previously reported, at 9:30 am, police arrived at Carriage Hill Apartments where Gaines lived. Shortly after arriving on scene, police learned that there was a firearm in the house, so they brought a SWAT team to deal with the situation. A standoff began which lasted throughout most of the day until the police decided to raid the home with guns blazing, killing Gaines and injuring the child. The reality is that, in this and any similar situations, the increase of force in close proximity, when the police are operating in what they consider a potential hostage situation, is a recipe for almost sure-fire disaster. Perhaps the most tragic part of the entire situation is the fact that all of this stemmed from a traffic stop for not having proper plates, registration etc., which then escalated to a physical altercation between Gaines and the officers after she refused to exit the vehicle. Gaines subsequently failed to appear on the charges, as it is likely she didn’t recognize the authority or legitimacy of the state’s claims against her, judging from some of her writings. The police then came to serve a warrant on her at which time they report she pulled a firearm and threatened them with it. Gaines was was stopped on March 11 in Catonsville by Baltimore County Police. She was charged with several traffic violations, including operating an unregistered motor vehicle, driving without current tags, driving an uninsured vehicle, failure to display registration card on demand, and driving a vehicle on a highway with a suspended registration, according to Maryland court records. She was also charged with resisting/interfering with arrest, disorderly conduct, disturbing the peace and littering, all misdemeanors. On July 13, she was charged with failure to appear in court and a warrant for her arrest was issued. Law enforcement officials claim to have taken down Gaines’ social media pages in the midst of the standoff, as she was posting videos during the standoff with police to communicate messages regarding what was transpiring. Although early reports on social media suggested her posts had been deleted, the photos, videos and other information on the accounts were not deleted, police said, but were preserved as evidence. She posted videos to her Instagram account before she was killed, with one of the videos showing a SWAT officer outside her door, and another show some of her final moments with her 5-year-old son, who was also shot and wounded during the incident. At a press conference hours after the killing, police said that Gaines pointed a gun at officers and threatened to shoot them if they entered the home. Police opened fire first, with her returning fire with two shots before being gunned down by officers. A second video appears to show officers dressed in tactical gear near the entrance to Gaines home, but it isn’t clear at what point during the standoff this video was recorded. Law enforcement has thus far refused to say whether it was the police or Gaines who shot the child, but judging by the lack of police claims that the Gaines shot the child, it can be reasonably assumed that he was hit by police fire. The police also claimed that upon entry Gaines pointed her weapon at officers and threatened to kill them, which prompted the final conflict. Alas, none of this can actually be independently verified, as the only evidence is the statement from police – with none of the police having body cams – and police having turned off all means of Gaines informing the world as to what was transpiring. On-scene command staff filed a request with Facebook during the barricade to deactivate Gaines’ Facebook and Instagram accounts in order to preserve the integrity of negotiations with her and for the safety of Gaines, her child and officers. Gaines was posting video of the operation, and followers were encouraging her not to comply with negotiators’ requests that she surrender peacefully. This was a serious concern; successful negotiations often depend on the negotiators’ ability to converse directly with the subject, without interference or distraction during extremely volatile conditions. Law enforcement officials do not have the ability or authority to deactivate social media accounts on their own. Facebook maintains a law enforcement portal through which police request assistance. This portal includes an “exigency” option for emergency situations like the one yesterday. BCoPD applied for the exigency deactivation because of a barricade situation involving an armed subject with a child. Facebook evaluates law enforcement requests and determines what action will be taken. It took nearly an hour after BCoPD contacted Facebook for Gaines’ accounts to be taken off line. Facebook has thus far refused to comment on their shutdown of Gaines’ social media accounts – but the fact that an individual can lose the ability to transmit an accurate record of what is transpiring to the world so easily during a rapidly escalating situation is dangerous for transparency and accountability, and has startling 1984-like implications. These types of actions inevitably lead to situations whereby the public is forced to rely on those that have done the killing to give a proper accounting of the events leading up to the death – an almost certain exercise in futility. The real question is should Facebook simply acquiesce to the demands of law enforcement so easily and shut down an individual’s perhaps most vital lifeline in a deadly situation such as this? Would the police have acted differently if they knew they were being livestreamed on Facebook, and would Korryn Gaines still be alive?? Gaines’ Instagram account and Facebook page were reactivated a day after the shooting. Let us know what you think in the comments section and please share this story with others to hopefully get people to think a bit deeper about the power that Facebook wields – and if they are using that power responsibly.